On both the Warren and Urbana fronts the inspection of 2 December found the Allied units, in the words of General Eichelberger, "scrambled like eggs." He at once ordered them regrouped and reorganized. On the Warren front, Company I, 128th Infantry, which had been operating under Colonel Carrier's command off the southwest end of the strip, was returned to Colonel Miller, and Company A, 126th Infantry, which had been under Colonel McCoy's command off the southeast end of the strip, was returned to Colonel Carrier. Colonel Miller's 3d Battalion, 128th Infantry, was disposed to the right of the strip and took up position in an arc extending from the sea to a point just below the dispersal bays at the eastern end of the strip. Colonel McCoy's 1st Battalion, 128th Infantry, moved in on Miller's left, just below (south of) the strip, and Major Harcourt's 2/6 Independent Company covered the gap between Carrier and McCoy. Warren Force had no reserve, but each battalion held small reserve elements out of the line. When Colonel Martin went forward to the Warren front early on 3 December to take command, he discovered first of all that the troops "had little in the nature of weapons and equipment of what was normally considered necessary to dislodge an enemy from a dug in, concealed position. "4 His forward CP, he found, was "a single shelter half suspended horizontally about five feet from the ground, under which the CP telephone rested against a log on the ground." Maj. Milton F. Ziebell, the regimental S-3, had with him, Martin remembers, a printed map "inaccurate for artillery fire," and "half of a small writing tablet, the kind selling in ten cent stores for a dime, and a pencil." When Martin asked the adjutant for his files, the latter "patted the pocket of his denim jacket which was a shade of black from the swamp mud, and said that he was keeping what he could there." Colonel Martin set himself to improve conditions, despite the prevailing "lack of almost everything with which to operate." One of the first things he did upon taking command was to call an officers' meeting at which he told his officers that the men "would be required to do all they could to better their conditions, their personal appearance, and their equipment." Sanitation would be improved. More attention would be paid to the care of equipment, and officers would cease commiserating with the troops and abetting them in the "feeling sorry for ourselves attitude" that he had noticed during his inspection the day before. Reorganization and regrouping were completed on 4 December. Fortified by an unwanted and much-needed two-day rest, the troops received rations and ammunition and prepared to resume operations under their new commanders. originally assigned there.8 Captain Yasuda had his Yokosuka 5th and Sasebo 5th Special Naval Landing troops, supported by naval pioneer units in the village, the Triangle, and the mission. The Japanese had thrown back every attack thus far, and they were ready to continue doing so. 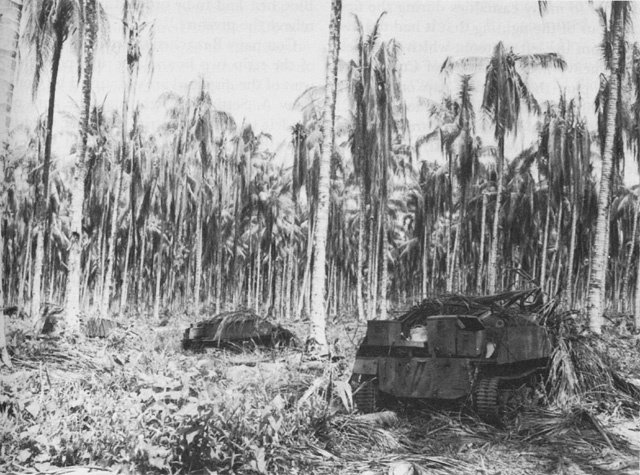 DISABLED BREN GUN CARRIERS in the Duropa Plantation. the twenty others in the carriers were killed, wounded, or missing. suffered so many casualties during the first half-hour of the fighting that it had to have help from the left platoon, which was itself under heavy fire. A platoon of Company I had to plug the resulting gap on the left before the attack could continue. pillboxes during the first two hours of fighting. With the enemy fire from the pillboxes suppressed, the troops began to close on the bridge, only to be halted by heavy fire from front and left when they were only 150 yards from their objective. Artillery fire was called for, but it proved ineffective. The Japanese fire only increased in intensity. On 4 December Colonel Tomlinson and 126th Infantry headquarters moved from Sanananda to the Urbana front, and advance parties of the 127th Infantry--which was also to be committed to the Urbana front--began reaching Dobodura.18 By this time the troops in the line--the 2d Battalion, 126th Infantry, the 2d Battalion, 128th Infantry, and the Cannon Company, 128th Infantry--had had a little rest. They would now have another chance to finish the job that they had not been quite able to complete on the 2d. The plan of attack called for the Cannon Company, 128th Infantry, and the 2d Battalion, 126th Infantry, to attack at specified points on the perimeter of Buna Village. Having suffered very heavy losses during previous attacks, Company F would be in reserve. The Cannon Company would remain on the left of the 126th Infantry and continue as before to support its operations. Colonel Smith's 2d Battalion, 128th Infantry, on Major Smith's right would complete the investiture of the left bank of Entrance Creek. Air and artillery bombardment would support the attacks. From positions behind the large grassy strip west of Entrance Creek, eight 81-mm. mortars would fire on the village. The troops of Company F, 128th Infantry, from their positions on the west side of the Girua River, would fire upon it with two 81-mm. mortars, a 37-mm. gun, and an assortment of light and heavy machine guns. Colonel DeGraaf, Colonel Rogers, Colonel McCreary, Colonel Tomlinson, Lt. Col. Merle H. Howe, the division G-3, and General Eichelberger's aide, Captain Edwards. The attack had opened at 1000 with a raid on the mission by nine B-25's. Eichelberger and his party were briefed on how the action was progressing and then went forward to observe the fighting. The attack met strong opposition. On the far left the Cannon Company ran into heavy fire when it emerged onto an open space south of the village. The company sent out patrols to flank the enemy, the mortar men on the west side of the Girua River began firing on the village to relieve the pressure, and a platoon of Company F, 126th Infantry, under 1st Lt. Paul L. Schwartz, moved in to reinforce the Cannon Company. None of these measures worked. The enemy fire continued, and the company could not advance. Company E, under Captain Schultz, also met tough opposition from the intrenched enemy. By dint of hard fighting, the line moved forward until it reached the Japanese main line of resistance about fifty yards from the village. There the advance was stopped completely, and the troops had to dig in. Bottcher's break-through completed the isolation of the village. The Cannon Company, 128th Infantry, and the 2d Battalion, 126th Infantry, less Bottcher's platoon, were now pressed tightly against its inner defenses, and the troops at Bottcher's Corner made its reinforcement from the mission extremely difficult, if not impossible. General Herring had suggested late on 5 December that Eichelberger try pushing forward on the Warren front by concentrating on the destruction of individual pillboxes and machine gun nests which lay in the way. This job, General Eichelberger assured Port Moresby the next day, he had "already decided to do." Since the Japanese line on that front had been found to be very strong, he added, he would make the main effort for the time being on the left, "while containing the Japanese on [the] right. "32 Instead of making frontal infantry assaults, which had gotten Warren Force nowhere, the troops now were to soften up the enemy line by attrition and infiltration, and to make the final break-through with the tanks when they arrived. The situation on Colonel Carrier's front during this period was one of unrelieved hardship. The positions occupied by the 1st Battalion, 126th Infantry [General Martin recalls], were almost unbearably hot in the day time as the tropical sun broiled down, the grass shut off all air, and held in the steaming heat. Due to enemy observation any daylight movement among the forward positions had to be by crawling which added to the misery from the heat. There were cases of heat exhaustion daily, and some of the company commanders strongly urged the battalion commander to permit the troops to withdraw about 300 yards in day time to positions where there was shade, and reoccupy the forward positions at night. The infantry attackers made few gains anywhere along the Warren front. Colonel Carrier's troops met repeated setbacks in their efforts to cross the bridge between the strips, and the forces under Colonel Miller and Colonel McCoy moved ahead only a few yards.41 The fighting had settled down to a siege. The attritional type of warfare ordered on the Warren front did not advance the line much, but the relentless pounding by the mortars and artillery and the sharp probing forays of the infantry were having exactly the effect intended by General Eichelberger--wearing the enemy down physically and softening up his defenses for the final knockout blow. The attack was to be mounted by the 2d Battalion, 126th Infantry, less the troops at Bottcher's Corner. Companies E and G were to attack on right and left, and the weapons crews of Company H, would support the attack by fire from a position to the right of Company G. The troops at Bottcher's Corner would hold where they were, and Company F would be available as required for the reinforcement of the other companies. The Cannon Company, 128th Infantry, now in regimental reserve, would take up a holding position in the area immediately below Musita Island, and the 2d Battalion, 128th Infantry, would continue to hold on the 126th Infantry's right. On 8 December the companies attacked again. Artillery, mortars, and machine guns opened up at 1400, and the troops started moving forward at 1415. Colonel McCreary's mortars laid down fire as close as fifty yards to the front of the battalion's advance elements, but the Japanese line still held, and the attack was beaten off once again. By this time the 2d Battalion, 126th Infantry, had launched twelve futile attacks on the village. Its companies had become so understrength that they could do little more than hold their positions. Companies E and F each had less than fifty effectives left, and the whole battalion totaled about 250 men. Its relief had long been overdue, and the task of delivering the final attack on the village went therefore to the fresh 3d Battalion, 127th Infantry, which together with regimental headquarters had completed its movement to the forward area by air on 9 December. Lt. Col. Herbert A. Smith, commanding officer of the 2d Battalion, 128th Infantry, had been told by General Byers a few days before that he would be called upon to take the Coconut Grove when Buna Village fell. Smith and his executive officer, Maj. Roy F. Zinser, lost no time therefore in preparing a plan for its reduction. Since the jungle fronting the grove was split by an open grassy area, the plan called for one company of the battalion to attack on the right under Smith and a second company to attack on the left under Zinser, whose unit was to make the main effort. About 1300 on 15 December General Byers came to Colonel Smith's CP, west of the grove, and told him he was to attack at once. Smith's battalion numbered about 350 men at the time, but they were scattered along a 1,750-yard front all the way from the apex of the Triangle and along the left bank of Entrance Creek to a point just below Musita Island. Not counting a platoon of heavy machine guns from Company H which was to play a supporting role, Smith had less than 100 men immediately available for the attack: about 40 men from Company E; about 20 men from a Company F platoon; 15 or 20 men from Battalion Headquarters Company; and about 15 men from the Regimental Cannon Company who happened to be in the immediate area. Smith requested more troops, and specifically asked for the rest of Company F, which was then in the Siwori Village area protecting the left flank. General Byers found it impossible to give Smith the men he asked for, and the attack was ordered to begin at 1500 with those he had available. After reducing this position with grenades and small arms fire, the troops on the left discovered a very large bunker which commanded the American approaches to the grove. Since the enemy strongpoint was accessible to both of them, the two forces began converging on it from right and left, clearing out intermediate obstacles as they went. In this fighting Major Zinser demonstrated conspicuous leadership, but it fell to two men of Company E on the right--Cpl. Daniel F. Rini and Pvt. Bernardino Y. Estrada--to clear out the main position. Rini and Estrada, members of the same squad, had been in the forefront of the company's advance. The climax came when Rini, covered by Estrada's BAR, got close enough to the main bunker to jump on top and knock it out. The fighting was over by noon. Thirty-seven Japanese were buried by the following day, and more were found and buried subsequently. The cost to the 2d Battalion, 128th Infantry, was four killed and thirteen wounded. not to be had at Buna. It was expected that the tanks, when they finally reached the front, would make up for these deficiencies. Brigadier Wootten flew to Popondetta at dawn the next morning, 11 December. After conferring with General Herring and Brigadier Hopkins, he and Hopkins flew to Dobodura where they met General Eichelberger. Wootten spent the afternoon reconnoitering the Warren front, and that night, while he slept at General Eichelberger's headquarters, the Karsik came into Oro Bay. The Karsik had in its hold four light American M3 tanks (General Stuarts) belonging to the 2/6 Australian Armored Regiment. It carried also a seven-day level of supply for the 2/9 Battalion. Maj. Carroll K. Moffatt, an American infantry officer serving with the COSC, supervised the unloading. He had just reached the area from Milne Bay with six Higgins boats (LCVP's) and two Australian barges, the first Allied landing craft to reach the combat zone. The actual unloading was done by troops of the 287th U.S. Port Battalion who had come in on the Karsik. They did the job quickly, and the ship got away safely before daylight. The tanks were transferred to specially constructed barges (which had reached the area a few days before), towed to shore, unloaded, and hidden in the jungle. They were reloaded on the barges the next night and then towed by luggers to Boreo. There they were landed, run into the jungle, and hidden at a tank lying-up point a few hundred yards north of the village. Brigade headquarters, the 2/9 Battalion, and the commanding officer of the 2/10 Battalion (who had flown in from Wanigela the night before) left in the Colac, Broome, and Ballarat early on 12 December. Traveling at high speed, the ships reached the rendezvous point off Cape Sudest late that night to find Major Moffatt and the eight landing craft waiting for them. 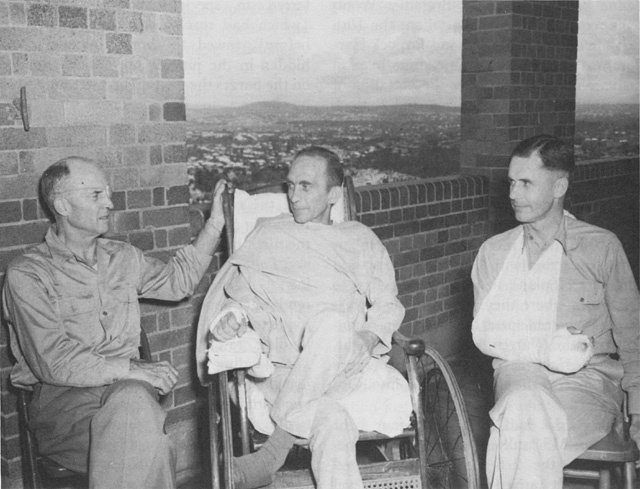 THREE GENERALS CONVALESCING in an Australian hospital, December 1942. Left to right, Generals MacNider, Waldron, and Byers. kind in the area. One LCVP was sunk, and another had to be beached, a total loss. Nine crew members were wounded, and one died before he could reach a hospital.80 The corvettes returned the following night. Instead of rendezvousing with the landing craft off Cape Sudest as planned, the corvettes landed the troops at Oro Bay, a full day's march away. The Japanese naval force was still in the area and unaccounted for, and the corvettes had no intention of running into it, especially with troops aboard. General MacArthur had been urging General Eichelberger to speed his preparations,84 and Eichelberger had done his best to comply. The attack General MacArthur had asked for was now ready. Warren Force was to move out on the 18th with tanks; its successive objectives were Duropa Plantation and Cape Endaiadere (including a bridgehead across the mouth of Simemi Creek), the New Strip, and the Old Strip. Urbana Force was to attack on the 19th--D plus 1. It was to storm the Triangle, cut through to the coast, and seize the track junction between Buna Mission and Giropa Point, thereby isolating the one from the other, and exposing both to attack on their inward flanks.85 Captain Yasuda and Colonel Yamamoto were now each faced with a double envelopment, and both were about to be caught in a pincers from which there was no escape. 1. Msg, Gen Harding to Comdr Sinclair, ANF, Ser 186, 1 Dec 42; Msg, Maj Milton F. Ziebell, S-3, 128th Inf, to Maj Chester M. Beaver, Ser 1833, 1 Dec 42; Msg, 5th Air Force to Gen Harding, Ser 1892, 2 Dec 42; Msg, Gen Eichelberger to GOC NGF, Ser 1990, 3 Dec 42; Msg, NGF to NOIC, Porlock Harbor, Ser 2122, 3 Dec 42; Msg, Maj Hall, 2/1 Aust Fld Rgt, to Brig L. E. S. Barker, Comdr Royal Australian Arty, 7th Aust Div, Ser 2035, 3 Dec 42; Msg, NGF to 32d Div Ser 2069, 3 Dec 42; Interv with Lt Col Carroll K. Moffatt, formerly CO Port Det E, COSC, Buna, 30 Oct 49; Hist 114th Engr Bn (C), Rpt, CG Buna Forces, pp. 17, 21, 23; Eichelberger, Our Jungle Road to Tokyo, pp. 26, 34-36. 2. Msg, Gen Waldron to NGF, Ser 2032, 3 Dec 42; Rpt, CG Buna Forces, p. 20, with accompanying situation maps, 2, 3, and 4 Dec 42; Ltr, Col MacNab to Gen Ward, 7 Mar 51. 3. Ltr, Gen Eichelberger to Gen Sutherland, 3 Dec 42; Ltr, Gen Eichelberger to Gen MacArthur, 12 Jan 43. Copies of both in OCMH files. Rpt, CG Buna Forces, pp. 92, 93. 4. Ltr, Col Martin to Gen Ward, 6 Mar 51. 6. Col Grose's Diary, 3 Dec 42, 4 Dec 42; Interv with Col Grose, 15 Nov 50; Ltr, Col Grose to Gen Ward, 26 Feb 51. 7. 3d Bn, 128th Inf, Jnl, 1430, 4 Dec 42; 128th Inf Jnl, Ser 34, 4 Dec 42; Msg, Col Martin to Gen Waldron, Ser 2033, 3 Dec 42; Ltr, Col MacNab to author, 15 Aug 50. 8. Yokoyama Det Orders, 16 Nov 42, in ATIS EP 29; 18th Army Opns I, pp. 20-21. The 144th and 229th Infantry troops under Yamamoto's command came in with him from Rabaul on 17 November and were thus fresher than any of their attackers. 9. 32d Div FO No. 2, 4 Dec 42; Ltr, Gen Eichelberger to Gen Sutherland, 4 Dec 42, copy in OCMH Files. 10. Msg, Maj Ziebell to Col MacNab, Ser 2137, 4 Dec 42; 3d Bn, 128th Inf, Jnl, 1300, 1430, 1638, 1700, 4 Dec 42. 11. 32d Div G-3 Jnl File, Ser 2357, 5 Dec 42; 128th Inf Jnl, Sers 7, 11, 13, 27, 30, 51, 60, 5 Dec 42; 3d Bn, 128th Inf, Jnl, 0820, 0830, 0835, 0842, 1515, 1712, 1840, 5 Dec 42; Rpt, CG Buna Forces, p. 21. Walker was posthumously awarded the Distinguished Service Cross. The citation is in GHQ SWPA GO No. 7, 15 Jan 43. 12. 128th Inf Jnl, Sers 24, 27, 30, 36, 46, 72, 5 Dec 42; 3d Bn, 128th Inf, Jnl, 0935, 0938, 1010, 1035, 1120, 1640, 5 Dec 42. 13. 128th Inf Jnl, Sers 67, 5 Dec 42; 1st Bn, 128th Inf, Jnl, Sers 11, 33, 34, 37, 40, 44, 60, 5 Dec 42. 14. Msg, Maj Ziebell to 32d Div, Ser 2357, 5 Dec 42; 128th Inf Jnl, Sers 21, 40, 43, 67, 70, 73, 108, 113, 5 Dec 42; 1st Bn, 128th Inf, Jnl, Sers 52, 58, 60, 67, 70, 5 Dec 42. 15. 128th Inf Jnl, Sers 23, 39, 47, 61, 77, 93, 5 Dec 42; 1st Bn 126th Inf, Jnl, Sers 506, 508, 510, 518, 526, 530, 532, 5 Dec 42. 16. Tel Msg, Capt Manning, RAA, to 32d Div, Ser 2013, 3 Dec 42; Msg, 32d Div to NGF, Ser 2057, 3 Dec 42; 1st Bn, 128th Inf, Jnl, Ser 31, 35, 3 Dec 42; 2d Bn, 128th Inf, Jnl, 1515, 3 Dec 42. On 3 December Japanese bombers, escorted by Zeros, had parachuted food and ammunition onto the northern end of the Old Strip for Yamamoto's troops. 17. 128th Inf Jnl, Ser 128, 5 Dec 42. 18. Msg, Adv NGF to 32d Div, Ser 2086, 3 Dec 42; Msg, NGF to G-2, I Corps, Ser 2090, 4 Dec 42; 2d Bn, 126th Inf, Jnl, 1400, 4 Dec 42; 127th Inf, The Battle for Buna. 19. 2d Bn, 126th Inf, Jnl, 1400, 1550, 4 Dec 42, 0730, 1008, 1030, 1100, 5 Dec 42; 2d Bn, 128th Inf, Jnl, 1930, 5 Dec 42; Allied Air Forces Opns Rpt, 5 Dec 42; Msg, Adv NGF to 32d Div, Ser 2180, 5 Dec 42; Rpt, CG Buna Forces, p. 21, with Situation Map, Urbana Force, 5 Dec 42; Eichelberger, Our Jungle Road to Tokyo, p. 28. 20. Interr, Yoshiteru Toyashima, 15th Naval Pioneer Unit, in 32d Div G-2 Interrogations and Translations File; 127th Inf Tact Hist, Papuan Campaign. 21. 2d Bn, 126th Inf, Jnl, 1105, 1115, 1117, 1345, 1410, 1554, 1730, 5 Dec 42. Both Beaver and Schwartz were later awarded the Distinguished Service Cross. The citations are in GHQ SWPA GO No. 1, 1 Jan 43. 22. 2d Bn, 126th Inf, Jnl, 1330, 1345, 5 Dec 42; Kahn, "The Terrible Days of Company E," The Saturday Evening Post, 15 Jan 44. Knode, Lutjens, and Graber were all later awarded the Distinguished Service Cross, and Lutjens was commissioned a 2d lieutenant. The citations for Knode and Lutjens are in GHQ SWPA GO No. 64, 28 Dec 42. Graber's posthumous award is in GO No. 1, 1 Jan 43. 23. Col Grose's Diary, 5 Dec 42; Interv with Col Grose, 15 Nov 50. 25. Tel Msg, Col McCreary to Gen Waldron, Ser 2207, 5 Dec 42; 2d Bn, 126th Inf, Jnl, 1330, 5 Dec 42; Interv, 1st Lt. Kenneth Hechler with Gen Waldron, Washington, D. C., 11 Mar 44; Ltr, Lt Col Herbert M. Smith to Gen Ward, 9 Mar 51; Rpt, CG Buna Forces, p. 2; Odell, Buna; Eichelberger, Our Jungle Road to Tokyo, pp. 31, 32. Bottcher was later awarded the Distinguished Service Cross and given a direct battlefield commission as a captain. His citation for the DSC is in GHQ SWPA GO No. 64, 28 Dec 42. 26. Rpt, CG Buna Forces, p. 21, with Situation Map, 5 Dec 42. 27. Byers did not take command of the 32d Division, since Brig. Gen. Frayne Baker, commander of the division's rear echelon in Australia and, after Waldron, senior officer of the division, became division commander when Waldron was wounded and evacuated. Ltr, Gen Eichelberger to Gen Sutherland, 18 Dec 42, copy in OCMH files; Ltr, Gen Sutherland to Gen Ward, 6 April 51. Both Waldron and Howe were later awarded the Distinguished Service Cross. Waldron's citation is in GHQ SWPA GO No. 60, 18 Dec 42; Howe's, in GO No. 64, 28 Dec 42. 28. Msg, Urbana Force to G-3, Buna Force, Ser 2244, 5 Dec 42; Msgs, Gen Byers to Gen Eichelberger, Sers 2253, 2254, 5 Dec 42; Ltr, Col McCreary to Col Handy, GHQ AGF, Washington, 11 Mar 43, copy in OCMH files. 29. Col Grose's Diary, 5 Dec 42; Eichelberger, Our Jungle Road to Tokyo, pp. 30, 31. Col George DeGraaf, Colonel Rogers, and Captain Edwards, who intervened briefly in the fighting in the center were all later awarded the Distinguished Service Cross. The citations are in GHQ SWPA GO No. 60, 18 Dec 42. 30. Ltr, Gen Eichelberger to Gen Sutherland, 6 Dec 42, copy in OCMH files. 31. Ltr, Gen Eichelberger to Gen Sutherland, 6 Dec 42; Intervs with Gen Eichelberger, 6 Feb 50, 26 Apr 50; Eichelberger, Our Jungle Road to Tokyo, p. 44. 32. Ltr, Gen Eichelberger to Gen Sutherland, 6 Dec 42. 33. 1st Bn, 128th Inf, Jnl, Ser 20, 6 Dec 42, Sers 3, 6, 7, 17, 7 Dec 42; 3d Bn, 128th Inf, Jnl, 1213, 6 Dec 42; 128th Inf Jnl, Sers 4, 65, 6 Dec 42, Sers 9, 13, 44, 7 Dec 42. 34. Tel Msg, Warren Force to 32d Div, Ser 2361, 6 Dec 42; Tel Msgs, Maj Ziebell to 32d Div, Ser 2454, 7 Dec 42, Ser 2693, 9 Dec 42; 1st Bn, 126th Inf, Jnl, Ser 541, 6 Dec 42, Sers 580, 582, 10 Dec 42, Sers 592, 595, 11 Dec 42; 128th Inf Jnl, Ser 24, 10 Dec 42; Ltr, Col Frank S. Bowen, Jr., G-3, I Corps, to Lt Col E. G. Smith, Rear Echelon, I Corps, 11 Jan 43, in I Corps Correspondence File; Gen Waldron, The Buna Campaign, copy in OCMH files. 35. Interv, Lt Hechler with Gen Waldron, 11 Mar 44. 36. Ltr, Col Marshall Darby, Ord Off, I Corps, Moresby, to Col William E. McCreight, G-4, I Corps, 6 Dec 42, in I Corps Correspondence File. 37. Rpt, CG Buna Forces, p. 75; Hist Buna Forces, I Corps Adv Echelon, in I Corps Correspondence File. 38. 1st Bn, 126th Inf, Jnl, Ser 601, 11 Dec 42, Ser 626, 13 Dec 42, Ser 646, 14 Dec 42; Rpt, CG Buna Forces, p. 76a. 39. 1st Bn, 126th Inf, Jnl, Sers 580, 583, 10 Dec 42, Ser 595, 11 Dec 42; 1st Bn, 128th Inf, Jnl, Ser 33, 10 Dec 42, Ser 6, 11 Dec 42; 3d Bn, 128th Inf Jnl, 1630, 10 Dec 42, 2030, 11 Dec 42. 40. Ltr, Gen Martin to Gen Ward, 6 Mar 51. 41. Sitrep, Warren Force to 32d Div, Ser 2693, 9 Dec 42; Msg, Warren Force S-2 to 32d Div, Ser 2769, 10 Dec 42. 42. Tel Msg, Maj Ziebell to Gen Byers, Ser 2767, 10 Dec 42; 1st Bn, 128th Inf, Jnl, Ser 25, 10 Dec 42; 2d Bn, 126th Inf, Jnl, 1000, 10 Dec 42; G-2 Hist Sec, GHQ FEC, Interv of Col Kazuyoshi Obata, Supply Staff Officer, 18th Army, Nov 42-Apr 44, copy in OCMH files; 18th Army Opns I, p. 46; Rpt, CG Buna Forces, p. 84. 43. Msg, 128th Inf to G-3, 32d Div, Ser 2751, 10 Dec 42; 128th Inf Jnl, Ser 20, 10 Dec 42; 1st Bn, 126th Inf, Jnl, Ser 637, 13 Dec 42, Ser 650, 14 Dec 42; 1st Bn, 128th Inf, Jnl, Ser 15, 14 Dec 42; 128th Inf, Jnl, 1900, 1915, 13 Dec 42, 1300, 14 Dec 42. "I am changing some of my leaders on the right flank" General Eichelberger told Port Moresby on the night of 13 December. "Young Clarkson," he continued, "who only left the military academy in 1938 is going to take one of the battalions on the right flank and Carrier is being relieved by Major Beaver. I know Clarkson well, for I raised him from a pup. . . . He is full of fight and will do what I tell him." Ltr, Gen Eichelberger to Gen Sutherland, 13 Dec 42, copy in OCMH files. 44. Col Grose's Diary, 6 Dec 42; Ltr, Col Grose to Gen Ward, 26 Feb 51; Rpt, CG Buna Forces, p. 23. 45. 126th Inf Jnl, entries 6-7 Dec 42. 46. Ltr, Col McCreary to Col Handy, GHQ AGF, 11 Mar 43. In describing his method McCreary using the technical language of the artillerist, wrote that he had "restituted a vertical photograph to a 1/10,000 fire direction chart," and "tied the mortars and our zone of action to the ground by survey and observed fire." 47. 2d Bn, 126th Inf, Jnl, 0640, 7 Dec 42; Tel Msg, Urbana Force to Gen Beyers, Ser 2422, 7 Dec 42. 48. Tel Msg, Urbana Force to CG, 32d Div, Ser 2422, 7 Dec 42. 49. 2d Bn, 126th Inf, Jnl, 0640, 7 Dec 42; 1334, 9 Dec 42. Mitchell distinguished himself further on 9 December by bringing in a prisoner for questioning. He was later awarded the Distinguished Service Cross. The citation is in GHQ SWPA GO No. 3, 6 Jan 43. 50. 2d Bn, 126th Inf, Jnl, 1335, 1405, 7 Dec 42. For the heroic example he set his men, Major Smith was later awarded the Distinguished Service Cross. The citation is in Hq USAFFE GO No. 36, 1 Jul 43. 51. 2d Bn, 126th Inf, Jnl, 1430, 7 Dec 42. 52. 2d Bn, 126th Inf, Jnl, 1405, 1805, 1910, 7 Dec 42; Odell, Buna. 53. 2d Bn, 126th Inf, Jnl, 1910, 7 Dec 42; 32d Div Sitrep, No. 89, 8 Dec 42; F. Tillman Durdin, The New York Times, 11 Dec 42. 54. 32d Div Sitrep, No. 91, 9 Dec 42; 32d Div Chem Sec AAR, Papuan Campaign. 55. 2d Bn, 126th Inf, Jnl, 2045, 8 Dec 42; G-3 Opns Rpt, No. 245, 8 Dec 42. 56. 2d Bn, 126th Inf, Jnl, 0950, 8 Dec 42, 1400 9 Dec 42; 32d Div Sitreps, Nos. 91, 92, 9 Dec 42. Downer was posthumously awarded the Distinguished Service Cross. The citation is in GHQ SWPA GO No. 7, 15 Jan 43. 57. 2d Bn, 128th Inf, Jnl, 1345, 8 Dec 42; 2d Bn, 126th Inf, Jnl, 0908, 1305, 11 Dec 42; 127th Inf Tact Hist, Papuan Campaign, 9, 10, 11 Dec 42; Rpt, CG Buna Force, p. 24. On 10 December, just as the 2d Battalion was about to be relieved, Pfc. Walter A. Bajdek, of Battalion Headquarters Company, made a dash under heavy enemy fire to reestablish communication with an advanced observation post overlooking the enemy positions. Bajdek was later awarded the Distinguished Service Cross. The citation is in Hq USAFFE GO No. 32, 15 Jun 43. 58. Entry, M Sgt A. K. Ushiro, 22 Jan 43, in 32d Div G-2 Interrogations and Translations File. On the 13th, while the Japanese were still holding, Sgt. Samuel G. Winzenreid of Company I, 127th Infantry, acting on his own initiative, single-handedly reduced a strongly held enemy bunker with hand grenades. Winzenreid was later awarded the Distinguished Service Cross. The citation is in Hq USAFFE GO No. 32, 15 Jun 43. 59. 127th Inf Tact Hist, Papuan Campaign, 12, 13, 14 Dec 42. 60. Msg, Col Tomlinson to Col Howe, Ser 3096, 14 Dec 42; 127th Inf CT Tact Hist, Papuan Campaign, 14 Dec 42; Durdin, The New York Times, 17 Dec 42. 61. 2d Bn, 128th Inf, Jnl, 1510, 15 Dec 42; Ltr, Col Herbert A. Smith to author, 23 Mar 50; Ltr, Gen Byers to Lt Col Roy F. Zinser, 20 Feb 51; Ltr, Col Zinser to Gen Byers, 1 Mar 51. Copies of last two in OCMH files. 62. Ltr, Col Zinser to Gen Byers, 1 Mar 51. 63. Ltr, Col Herbert A. Smith to author, 23 Mar 50; Rpt, CG Buna Forces, p. 26. 64. Ltr, Col Zinser to Gen Byers, 1 Mar 51. 65. Ltr, Col Herbert A. Smith to Gen Ward, 20 Mar 51. 66. Ibid; 2d Bn, 128th Inf, Jnl, 0820, 1140, 1200, 1410, 16 Dec 41; 32d Div Sitrep, No. 106, 16 Dec 42. Zinser, Rini, and Estrada were later awarded the Distinguished Service Cross. Smith and Stehling, the Silver Star. Zinser's citation is in Hq USAFFE GO No. 2, 11 Jan 44; Rini's and Estrada's posthumous awards are cited in GHQ SWPA GO No. 9, 19 Jan 43. The Silver Star citations are in Hq 32d Div GO No. 54, 14 Jan 43, and in GO No. 28, 6 Apr 43, of the same headquarters. 67. Tel Msg, Col Howe to Col Tomlinson, Ser 3488, 17 Dec 42; 32d Div Sitreps, No. 106, 16 Dec 42, No. 108, 17 Dec 42; 127th Inf CT Tact Hist, Papuan Campaign, 16 Dec 42. 68. 32d Div Sitrep, No. 106, 16 Dec 42; Msg, NGF to 32d Div, Ser 3587, 17 Dec 42; Ltr, Col Herbert A. Smith to author, 23 Mar 50; Ltr, Col Zinser to Gen Byers, 1 Mar 51. 69. Ltr, Gen Eichelberger to Gen Sutherland, 16 Dec 42. 70. 32d Div Strength Rpt to Col Joseph S. Bradley, CofS, 32d Div, Ser 2932, 11 Dec 42, in 32d Div G-3 Jnl. The detailed figures are: KIA, 113; WIA, 490; MIA, 64. Warren Force sustained 422 of these casualties; Urbana Force, 245. 71. 3d Bn, 128th Inf, Jnl, 1100, 13 Dec 42. 72. 32d Div G-4 Sec, Record of Air Shipments, Rear Echelon, Port Moresby, Papuan Campaign; Interv with Col Moffatt, 30 Oct 49. 73. 128th Inf Jnl, 0230, 0450, 1232, 8 Dec 42; 0500, 9 Dec 42; 0825, 1838, 1925, 11 Dec 42; Msg, Gen Byers to NGF, Ser 2710, 10 Dec 42; Msg, Gen Eichelberger to Gen Kenney, Ser 3039, 13 Dec 42; 32d Div G-4 Sec, Record of Air Shipments, Rear Echelon, Port Moresby, Papuan Campaign. 74. Msg, NGF to 32d Div, Ser 2775, 10 Dec 42; Msg NGF to Adv NGF, Ser 3630, 18 Dec 42; 128th Inf Jnl, Ser 24, 11 Dec 42, Ser 13, 12 Dec 42; Ltr, Col Horace Harding to Lt Col James F. Collins, 4 Jan 43, in I Corps Correspondence File; Memo, Col Irwin, 6th Aust Div, for Brig Wootten, 4 Jan 43, sub: Japanese Strongpoints--Expedients in Assisting Attack, copy in OCMH files. 75. Rpt, CG Buna Force, pp. 23, 27, 28; Interv with Gen Eichelberger, 6 Feb 50; Eichelberger, Our Jungle Road to Tokyo, p. 44. 76. Ltr, Gen Blamey to Gen MacArthur, 8 Dec 42, in G-3 Jnl, GHQ SWPA; NGF OI No. 49, 9 Dec 42; Rpt on Opns 18th Bde Gp at Cape Endaiadere and Giropa Point. 77. NGF OI No. 49, 9 Dec 42; Interv with Col Moffatt, 2 Mar 50; The Koninklijke Paktevaart Maatschapij (K.P.M. Line) and the War in the Southwest Pacific Area. 78. NGF OI No. 51, 11 Dec 42; Rpt on Opns 18th Inf Bde Gp at Cape Endaiadere and Giropa Point. Since Wanigela and Porlock Harbor were only a short distance from Buna, the transfer of the 2/10th to the front by corvette could be made quickly once it had been relieved by the battalion of the 7th Brigade. 79. Rpt on Opns 18th Inf Bde Gp at Cape Endaiadere and Giropa Point; Interv with Col Moffatt, 30 Oct 49. The enemy force was the one bearing General Oda and the 1st Battalion, 170th Infantry, which was to reach the mouth of the Mambare the following morning. 80. Rpt on Opns 18th Inf Bde Gp at Cape Endaiadere and Giropa Point; Interv with Col Moffatt, 30 Oct 49; Kenney, General Kenney Reports, pp. 165, 166. General Kenney's story of the bombing is inaccurate in that he says that no one was hurt, and fails to mention that, in addition to the one craft sunk, a second was rendered useless and had to be abandoned. The figures given are from records kept by Colonel Moffatt, who was in charge of the landing craft. 81. Rpt of Opns 18th Inf Bde Gp at Cape Endaiadere and Giropa Point; Interv with Gen Eichelberger, 6 Feb 50; Interv with Col Moffatt, 30 Oct 49; Hist Port Det E, COSC, Buna. 82. Rpt, CG Buna Force, p. 27; Eichelberger, Our Jungle Road to Tokyo, p. 41. Byers, who was wounded immediately after his troops jumped off, was awarded the Distinguished Service Cross nine days later. The citation is in GHQ SWPA GO No. 63, 24 Dec 42. 83. Tel Msg, Brig Hopkins to 32d Div, Ser 3227, 15 Dec 42; Tel Msg, 18th Bde to 32d Div, Ser 3426, 17 Dec 42; Rpt on Opns 18th Inf Bde Gp at Cape Endaiadere and Giropa Point. 84. Ltr, Gen MacArthur to Gen Eichelberger, 13 Dec 42, copy in OCMH files. 85. NGF OI No. 53, 16 Dec 42; Buna Force FO No. 3, 17 Dec 42; 18th Aust Bde Gp Opns Orders No. 1, 17 Dec 42.